Thankyou for visiting our website, we trust you will find all the information you need. We offer high standards of service and our brilliant promenade hotel provides a friendly welcoming atmosphere every time. Open all year, it is situated in a superb Promenade position, between Central and South Pier, between the Tower and the Pleasure Beach, making us an ideal base for your holiday in Blackpool. We are constantly investing in the Lyndene and the Hotel now offers over 141 fully equipped and tastefully decorated en suite bedrooms, enhanced with a wall mounted flat screen LCD televisions with Freeview/Radio, in room safes, hospitality trays, hairdryers and telephones. Three lifts provide access to all three floors plus there are a selection of ground floor rooms. A disabled accessible ground floor toilet has now been added. Smoking & non smoking bedrooms are available, please specify at time of booking. Our hotel offers three newly refurbished licensed bars and two magnificent air conditioned, sea view cabaret lounges. The Lyndene Hotel offers superb compered entertainment EVERY NIGHT of the year, from fabulous vocalists to side splitting comedians, along with a superb keyboard player, playing early evenings. Due to popular demand the fabulous Tribute Acts shown at the Lyndene will continue during midweeks and weekends throughout the year. With afternoon dancing with our resident keyboard player, along with either karaoke or a flutter on the racing plus bingo most afternoons, you won’t be bored. As well as Sky Sports we have also installed BT Sport so there will be no excuse to miss your favourite game. Complimentary high speed wifi is available in all of our bedrooms and public areas so you can access your own entertainment online and keep your friends posted with pictures of your trip. The hotel is known for the high standard and varied choice of cuisine, and dining is a pleasure in either of our two quality restaurants. A variety of all day snacks and light refreshments are available in our sea view bar lounges, where our promenade hotel offers panoramic views of the Irish Sea and Blackpool Promenade. There is also an outside seating area/sun terrace. 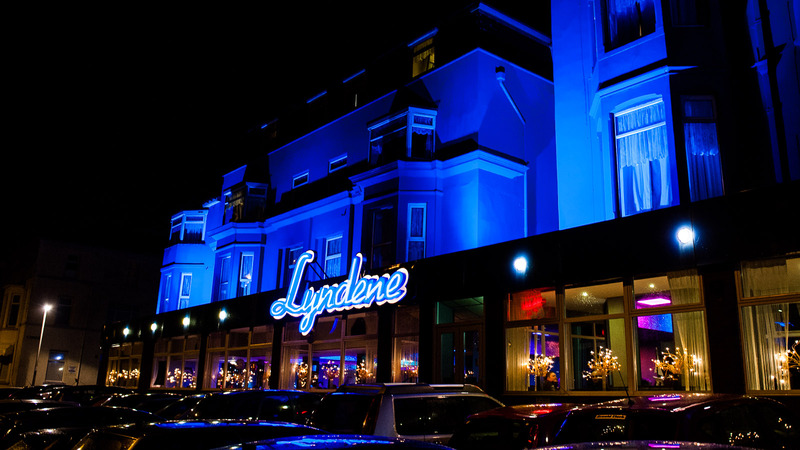 The Lyndene Hotel is proud to work with Merlin Entertainments and are ticket agents for their attractions. All guests are able to buy reduced price tickets for Blackpool Tower, Eye & Ballroom, along with Sealife, Dungeon and Madame Tussauds from our reception. As soon as you arrive until the time you depart you can be sure of warm and friendly service from our courteous and helpful “Lyndene Family”. Our aim is to make your stay both comfortable and enjoyable, so like many others you will become a firm friend and return to us year after year. The Management and Staff look forward to welcoming guests, old and new to the Lyndene Hotel. Access Statement: This access statement does not contain personal opinions as to our suitability for those with access needs, but aims to accurately describe the facilities and services that we offer to all our guests/visitors.